My dog, Taedyn, and I have a symbiotic relationship. We go everywhere together, work together, play together and help each other out whenever we can. We have a doggie backpack so that we can both share the load of carrying the things we need once we reach our destination. When my back went out -- preventing me from even being able to carry a purse -- we (awkwardly) modified the backpack so Taedyn could help bring my laptop and other essential items to and from work. Taedyn and I met over 4 years ago at a SPCA shelter. The intensity of our bond struck immediately and caused me to burst into tears when she asked for a head rub -- the only dog who made me cry during my entire search. I tried to approach finding my next partner in a pragmatic fashion and decided to not adopt her despite my tears. Taedyn was classified as a “counter surfer" -- a six year old dog who had a puppy’s abundance of seemingly unlimited energy. After the third time we met and the third time I burst into tears, emotion took over and Taedyn and I went home together the next day. I’m not going to tell you that working with Taedyn was a walk in the park in those first few months of living together. In fact, we could barely walk to the park because her insatiable excitement for the world and everything within it drove her to try to reach everywhere simultaneously, making it virtually impossible to actually get anywhere. But, I directed that energy towards the work she needed to do for me and her voracious curiosity was funneled into a driven passion for work. We’ve since taken road trips across the United States several times and rarely ever are parted. She accompanies me every day on the MUNI and slumbers at my feet while I work. Over time, however, we began to hit the limit of how much Taedyn can comfortably carry when slung over her back. Once we moved to the city and I abandoned my car, we encountered an increasing number of situations where she was simply unable to help me out. Grocery shopping, taking out the laundry, and heading out with a pro’s-quantity of photography gear -- a mere backpack just couldn’t cut it. The thought began to take seed in my mind, “What if I could put some stuff on wheels so she could pull it?" And that is when I discovered dog draft carting. Dog carting has a significant community around it. 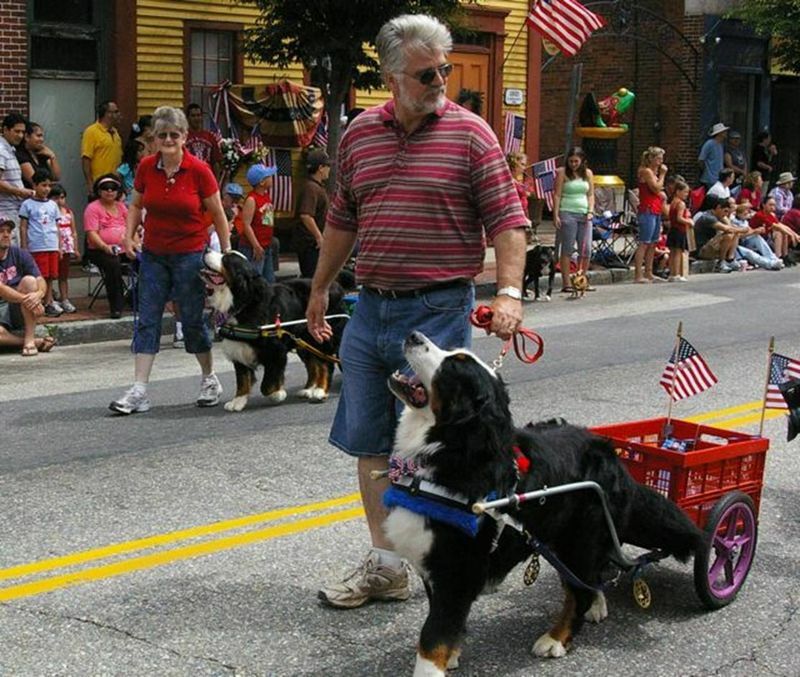 Anyone aiming for titles with a Bernese Mountain Dog, Newfoundland or Swiss Mountain Dog has probably taken up dog carting. It is an important job for these dogs to help pull a load, and so part of the breed conformation is to ensure the dog can do that job. Owners of powerful dog breeds have also engaged in weight pulling to help their dog enjoy the thrill of using every part of their muscles to pull a heavy load (I picture this as much like the thrill bodybuilders achieve when they competitively lift weights). Some take up carting as a fun activity while being a part of a parade or taking small children for a ride around the yard. The object being pulled can be a cart (two wheels), a wagon (four wheels), or a sled (on skis). A simple cart could support one or two plastic crates, or -- my favorite -- a collapsible crate. A more sophisticated cart could be designed like a carriage with a seat to fit a small child. The cart is pulled by traces. These attach to the cart and facilitate transferring the force of the pull onto the dog’s chest and shoulders. The traces are generally attached to an intermediary called a single tree which spreads the traces apart near the cart and minimizes the jerking movement from walking by transferring the force of each step into one smooth pull. A spreader bar is a similar device that serves the same purpose but is integrated with the harness and rests inches from the dog’s rear. 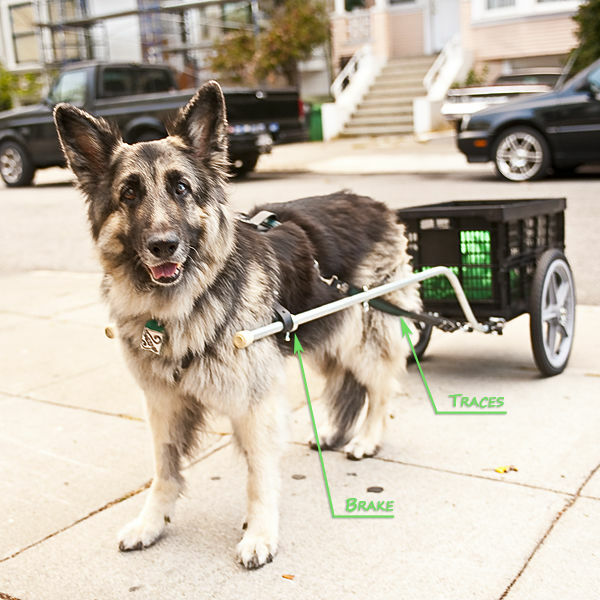 One or two shafts (multi-dog and single dog, respectively) attached to the cart rest upon the dog’s harness to facilitate braking and prevent the cart from hitting the back of your dog’s legs. The shafts generally rest within loops attached to the harness and can freely move back and forth. The shaft is prevented from moving too far forward by a larger item affixed to the shaft -- such as a screw or large washer -- which is too big to slip through the loop on the harness. This is what will brake the cart to ensure it stops when your dog stops. Now, you may think that you can throw a set of wheels on a crate and be ready to go. However, the last thing you need to be aware of is the balance of the cart. Carts are carefully designed distribute the weight so it is not front or back heavy. The goal is for the shafts to not have a significant force pulling them up or keeping them down. It should be effortless to move the shafts up and down, which will allow them to shift along with your dog’s canter with negligible force against the harness. 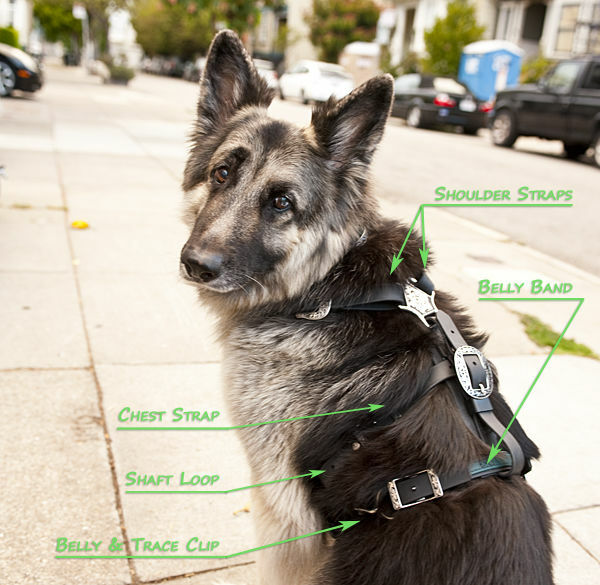 The job of the harness is to transfer the force of the pull onto your dog’s chest and shoulders. Although you could probably modify a typical harness for draft use, it would be best to use a harness made specifically for drafting if your dog is going to pull any significant amount of weight. You will see in these pictures that Taedyn’s harness has wide straps, and shorter-haired dogs would want to take advantage of padding along the chest and shoulder straps. There are a multitude of different types of harnesses, each optimized for different use cases. The most all-around-useful type of harness is the siwash harness (and variants called modified siwash harness), which provides uninhibited movement around the shoulders and is versatile enough for a wider range of applications and body shape. A siwash-type harness can be identified by the three straps meeting at the front of the chest -- two over the shoulders and one under the chest. The strap under the chest splits into two and attaches on either side of the abdomen to both the straps that had gone over the shoulders and the traces that attach to the cart. This is the structural part of the harness facilitating the pull of the cart, and are sometimes referred to as traces of the harness. Some harnesses will secure these straps in place by a belly band, which runs the circumference of the abdomen. 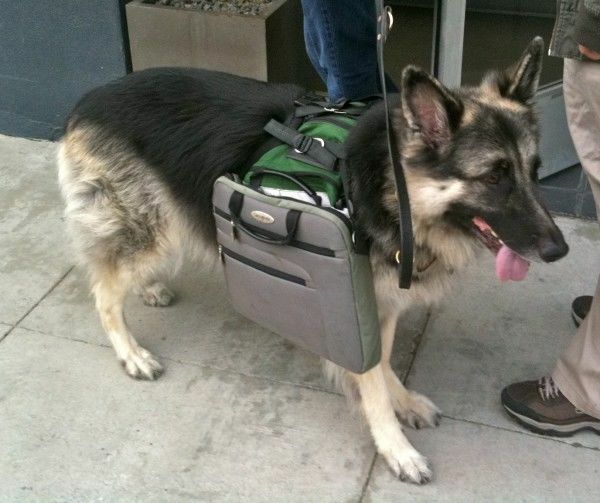 A chest strap goes around the circumference of the dog’s chest just behind his armpits and provides a brake for the cart so it stops when your dog stops. The traces of the harness may be adhered to the chest strap, or lay over it unattached. The cart’s shafts rest loosely in loops attached to the sides of the chest strap which are large enough for the shaft to slide back and forth, but too narrow for the brake of the shaft to fit through. When the cart does brake against the loops the chest strap will prevent the harness from slipping over your dog’s head. I have told you all this because I was incredibly confused when I ordered the cart and harness, so hopefully this article will arm you with enough knowledge to make informed choices. Fortunately, I got great help from Steve Diers and Martha McCormick as they patiently walked me through the details. Steve Diers, of Draft Carts for Dogs (http://www.draftcartsfordogs.com), made a collapsible cart specifically to Taedyn’s measurements. The shafts are bent in such a way that they will come up to Taedyn’s midsection, and slant slightly inwards to be slightly wider than Taedyn herself. The length is cut to be as long as Taedyn with enough room for her gate in the rear. Taedyn’s exquisite harness was made by master craftswoman, Martha McCormick, of All Things Bright and Biothane (http://allthingsbiothane.com/). I had a lot of fun working with Martha to design a great looking harness. Although I was aiming for a purely utilitarian harness, I fell smitten over Martha’s portfolio on Facebook (https://www.facebook.com/pages/All-Things-Bright-Biothane/146288622095785?sk=photos), and we designed a harness together. I provided Taedyn’s measurements so the harness would be perfect for her body shape. The siwash harness, however, is adjustable so I should be able to continue using the harness with any future companions I may have. Martha McCormick has integrated draft carting into her life. 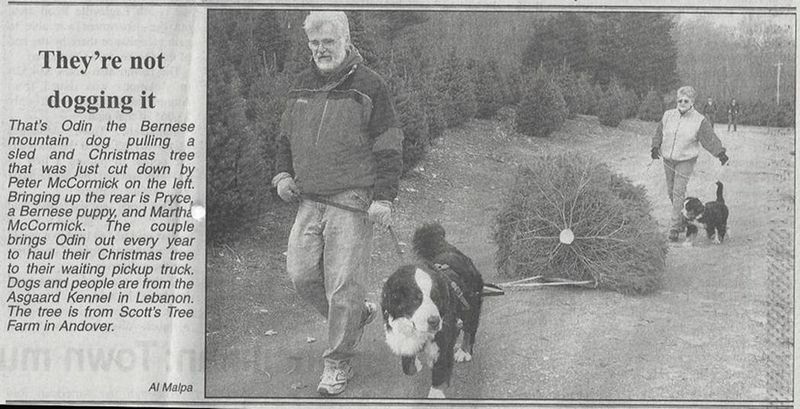 She has put her dogs to work helping her bring items back and forth to the farmer’s market and hauling Christmas trees for both herself and others. Her dogs have also brought a lot of joy to her community while prancing in parades and participating in fund raising walks. Martha expresses her artistic talent through the equipment she makes and provides additional flare to their normally purely functional purposes. Martha’s hand-crafted harness and traces has Taedyn trotting down the San Franciscan sidewalks in style. Both Steve and Martha resurrected the collapsible crate cart after Martha discovered the original version was discontinued and no longer available for anyone to purchase and use. 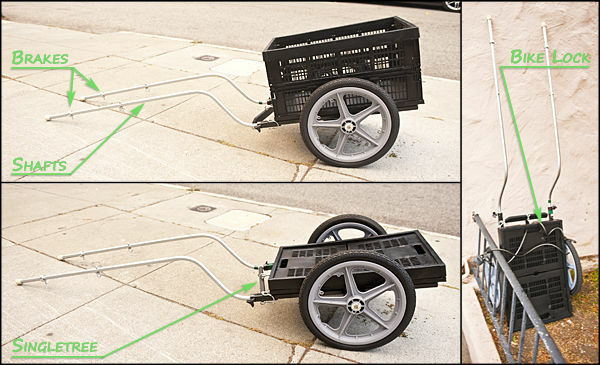 Steve strengthened and optimized the original design and has created a cart that comes completely apart -- wheels, shafts, crate and all -- and makes it easy to store or put in the trunk of a car. The collapsible crate makes it easy bring it up and down narrow staircases and lean the fully assembled cart up against a wall. Steve now builds, sells and ships these carts to anyone in the US and Canada. My cart travelled from New Hampshire to California in impeccable condition. Training your dog to pull a cart is straightforward if you are well accustomed to dog training, so it took Taedyn and I no time at all getting started -- Taedyn, bless her heart, will do anything I ask of her. Our goal was to ensure Taedyn was comfortable being between the shafts and having something rolling behind her. She was a bit put out by the latter! She didn’t immediately understand why this thing was following her, and was a bit peeved at having her mobility hampered by the shafts when she tried to check what was behind her. We took things one step at a time and by the end of the first evening she was padding her way up and down the sidewalks watching me intently for more treats. The final step of training is backing up with the cart, which is important when training your dog for more utilitarian purposes. The very first time we set out to work with the cart we encountered a need to back up! Fortunately again, Taedyn had already understood that the word “back" means take one step back. During one of our random clicker training sessions, I rewarded her whenever she got frustrated and backed up to display her impatience. Very quickly I shaped the word “back" to that behavior and she’s stuck with it ever since. On our very first trip we got to put to put that training to good use. I had brought her inside to drop off the laundry, and then she was able to back right up and out the door like a champ. During our first trip, Taedyn showed that she was confused as to what in the world we were doing. It was one thing to walk up and down the block, but for what arcane reason were we travelling out of home range in this confining device? She looked up at me on several occasions with a look I could only interpret as raising one eyebrow in a quizzical expression, “What are you thinking, Kathleen?" Once we dropped off the laundry and started heading home, I saw her entire demeanor changed. She had that same proud look and lightness in her step like she does after she’s accomplished something that took a lot of work -- like searching through the house and finding the ball hidden in a drawer. My takeaway is that once she saw me drop off the laundry she had put all the pieces together and realized she just helped me carry the laundry. She has stood by on countless occasions and watched me struggle and groan as I heaved the bag of laundry down the street, limped home and then sprawled flat across the floor whimpering about my poor back. She may have realized that her work had just saved me that discomfort. And what working dog wouldn’t be proud of that? We could quite possibly be the only dog carting team walking the streets of San Francisco. Fellow pedestrians have so far just let us pass by while frequently commenting what an awesome dog Taedyn is. Yup. Taedyn is awesome. Engaging in dog carting been one great step forward to improving our work together.